In this podcast, Fields End organizer Barbara Clarke and bestselling author Ann Hood tell BCB host Channie Peters about a multi-faceted event in the auditorium of Bainbridge Island Museum of Art on the evening of Saturday, October 18, from 7 to 9pm. Ann Hood will fly in from her Rhode Island home to join a troupe of actors in reading excerpts from “Knitting Yarns: Writers on Knitting“. The book, which she edited, is a collection of essays by well-known authors on their knitting experiences. Selections from the book will be read by some of Bainbridge’s finest actors: Dinah Manoff, George Shannon, Barbara Deering and Liz Ellis. The readings are directed by Kate Carruthers. 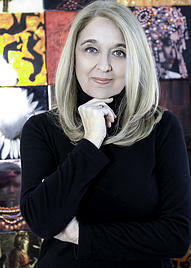 Ann Hood is the author of the just-released novel “An Italian Wife” and editor of the aforementioned bestselling collection of essays on knitting. Ann became an avid knitter in 2002 to help get through the grief of losing her daughter, Grace. Through knitting, she was able to pick up her craft again and share her painful journey with readers. Knitting Yarns is a testament to the power of craft to sustain us through human survival and triumph alike. Barbara Clarke describes Ann as a fine novelist, essayist, in-demand teacher, mother, and for this event – Knitting the Arts Together – an ardent knitter. She is here for one weekend – October 17th and 18th — and will also meet and greet customers at Churchmouse Yarns and Teas on Friday night from 7 to 8:00 PM. 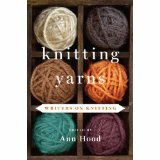 “Knitting Yarns: Writers on Knitting,” edited by Ann Hood. Barbara discovered Knitting Yarns through one of the essays in the book by Barbara Kingsolver. She thought it would be wonderful to bring Ann to Bainbridge and have a troupe of actors provide the extra benefit of their dramatic readings. This is NOT a lady’s only evening or just for knitters. The event will cover a wide spectrum of experiences and insights, and will end with Ann reading from her own essay. This event is co-sponsored by Fields End, Churchmouse Yarns and Teas, and Eagle Harbor Book Co.
Making the evening even more special is a “goody bag” waiting for you at the door. A book signing and reception will follow. Purchase a ticket online at Fields End, or at the door (if tickets remain): $30.00. Seating is limited.